Although commerce is older even than the thirty pieces of silver that persuaded Judas Iscariot to betray Jesus Christ, it took humans a long time to start to formally teach, and learn, the elements of business. The oldest business school in the world, ESCP Europe, was set up in Paris in 1819, a pipsqueak in comparison with Oxford, where teaching is said to have begun in 1096. Most of us assume that the Indian Institute of Management in Ahmedabad, born 1961, is the oldest in the country. Not so. The oldest "business" school is the Indian Institute of Social Welfare and Business Management in Kolkata. 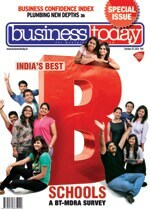 That is not the only gem we uncovered in this year's Best B-schools survey, our fourteenth. >> A shooting-from-the-hip investigation of the stasis and complacency that plagues our IIMs, written by a team of reporters led by Senior Editor Shamni Pande and Senior Associate Editor Goutam Das. >> That segues into a very candid and refreshing interview by Senior Editor N. Madhavan with Dr Ashish Nanda, who was lured from Harvard Law School to be IIM Ahmedabad's new director (he started his job on September 2). >> Assistant Editor Taslima Khan completes the IIM-A picture with a report on its unique incubation centre. >> Very engrossing stories by Associate Editor E. Kumar Sharma, who lives in the same town as the Indian School of Business, on path-breaking courses offered by B-schools on familyrun businesses and ethics. >> An excellent report on schools that teach rural management written by Madhavan. A sobering look at why research chairs at B-schools are going a-begging by Associate Editor Suprotip Ghosh - this links back to the story on the problems at IIMs. >> Detailed reports on high-achieving schools like the Bharathidasan Institute of Management in Trichy, which leapt from 96 to 32 in the rankings; Delhi's International Management Institute, which jumped from 35 to 10; the T.A. Pai Management Institute in Manipal which vaulted from 45 to 19; and Management Development Institute in Gurgaon, which held its No. 8 rank. Don't miss the excellent infographics on findings from the survey by Assistant Art Director Santosh Kushwaha. You will get a great overview of the trends in management education in the lead story by Pande, who steered the complex logistics of writing, travelling, research, design, and photography by the BT team. She was partnered by Deputy Editor Alokesh Bhattacharyya, who for several months also worked with MDRA on the painstaking survey and the rankings - including going with researchers on data-verification visits. A huge enterprise that could make for a good case study! This special issue was also the perfect launching pad for our newest initiative and one I believe will become a favourite in B-schools - a once-monthly debate between two students from different schools on a hot business or economy topic. Enjoy the first debate and vote for the best comment - there's a prize to be won. This issue of the magazine is exploding with good stories too numerous to name in this limited space, but I must draw your attention to the latest edition of our bellwether BT-C fore Business Confidence Index. No prizes for guessing how sentiment is going - to its lowest since we launched the survey in early 2011. Read Assistant Editor Manu Kaushik's report on the same.